China on Tuesday handed over a state-of-the-art library complex to Tanzania to support the country's education sector. Tanzanian President John Magufuli thanked China for the 41-million-U.S.-dollar project located in the University of Dar es Salaam at the handover ceremony. 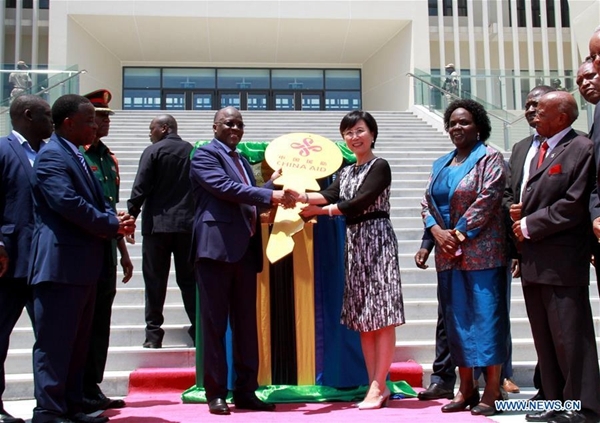 "Many thanks to China and many thanks to the people of China," said the president shortly before the Chinese Ambassador to Tanzania, Wang Ke, handed over the new library to him. President Magufuli said the friendship between China and Tanzania started many years back with the construction of the Tanzania-Zambia Railway Authority (TAZARA) in the 1970s and the Urafiki Textile Mills. Magufuli urged Tanzanians to learn Chinese, explaining that with the increasing investments of Chinese firms in the country and the anticipated increased number of Chinese tourists to the country, the future looked bright. Wang Ke, the Chinese ambassador to Tanzania, said the library will help accelerate reforms and transformations pioneered by President Magufuli. "Apart from funding the construction of the library, the Chinese government has also provided free information and communication technology, maintenance systems and furniture to the library," said Wang. The Chinese envoy said the 54 years of diplomatic relations between the two countries were special, adding: "We have every reason to maintain and strengthen this relationship." Joyce Ndalichako, Tanzania's minister of Education, Science, Technology and Vocational Training, said the library will enable university students from across the country widen their knowledge and skills for the welfare of the country. The library complex covers an area of 4.7 hectares with a floor area of 20,000 square meters. It consists of a library, a Confucius Institute and a Sino-Tanzania Cultural Exchange park. With the capacity of stocking 800,000 books, the library can house 2,100 people at the same time.